N 17689 at Fairoaks - EGTF, United Kingdom. C-GHYA at Watson Lake - CYQH, Yukon. N17689 at Vancouver - CYVR, British Columbia. 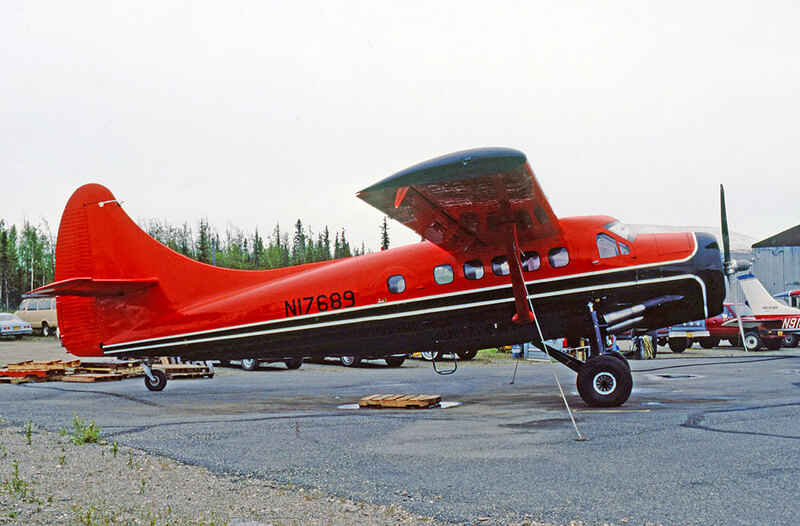 N17689 in early colours at Fairbanks. N17689 at Fairbanks - PAFA, Alaska. N17689 at Anchorage, now turbine powered with KATMAI. N17689 parked at Lake Hood, Anchorage. N17689 slight change to titles noted. • G311 Ghana Air Force. Delivered 19-Apr-1963. Based at Takoradi Air Base. Note: The following registration CF-ZFP was allotted to Lambair Ltd., The Pas MB. on 21-Apr-1971 who were considering a deal to purchase seven of the Ghanaian Otters. However the deal did not proceed and the allotment was withdrawn by Department of Transport 30-Apr-1971. • G311 withdrawn from service in 1973 and put up for sale. • N17689 Joseph V. Masin, Rodenkirchen, West Germany. (C-GLCU) Air Craftsmen Ltd., purchased and reserved marks on 26th April 1974. However the registration was NTU and the aircraft was ferried with the previous American registration. • N17689 Sold to Peter Press, (or Pess), San Diego, CA, a representative of Aerosierra de Durango, Mexico. XA-FEU Aero Sierra de Durango S.A., Durango, Mexico. Regd Oct-1975. Canx Nov-1977. Entries preceded by a date are extracts from the Canadian Department of Transport archives. 01-May-1978 allotment of C-GHYA to DHC-3 msn 431 for BC-Yukon Air Services Ltd., Watson Lake, YT. 16-Jun-1978 application to FAA for Export Certificate of Airworthiness by Peter Press, Aero Sierra, San Diego, CA, for N17689. Total time since new: 2,357 hours. • N17689 Peter Press, Aero Sierra, San Diego, CA, Regd 12-Jun1978. Canx 23-Jun-1978. 19-Jun-1978 Bill of Sale; Peter Press to BC-Yukon Air Services Ltd.
20-Jun-1978 Canadian duty and taxes paid at Vancouver, BC. 22-Jun-1978 Provisional Certificate of Registration for Certificate of Airworthiness test flights. 23-Jun-1978 Certificate of Airworthiness issued (Canadian C of A work by Aero Flite Industries Ltd, Vancouver, BC). 23-Jun-1978 Certificate of Registration issued to BC-Yukon Air Services Ltd., Watson Lake YT. • C-GHYA B.C.Yukon Air Service Ltd., Watson Lake, YT. Regd 23-Jun-1978. Canx 10-May-1984. 04-May-1984 Bill of Sale; BC-Yukon Air Services Ltd., to Wright Air Service Inc., Fairbanks, AK. • C-GHYA Cancelled from Canadian Civil Aircraft Register 09-May-1984..
• N17689 Wright Air Service Inc., Fairbanks, AK., by Bill of Sale dated 4th May 1984. Regd 10-May-1984. Canx 21-Feb-1996. Total time: 5,490 hours at time of sale. Accident: Sheenjek River, AK. 02-Sep-1989. On a short final approach to land on a gravel bar, the, the wheels dug into the sandy terrain and the Otter nosed over, causing considerable damage. Accident: Beaver Village, AK 30-Jun-1990. The pilot reported a substantial loss of power while in cruise flight. The aircraft was unable to maintain altitude and crashed into trees, causing minor injuries to one of the nine occupants. • N17689 Robert P. Bursiel, Fairbanks, AK (The head of Wright Air Service). Regd 21-Feb-1996. • N17689 Katmai Pro Shop Inc., King Salmon, AK. Regd 10-Jun-1996. • N17689 Renamed Katmai Express Inc. (Affiliated with Katmai Fishing Lodge). Power plant: Converted to Vazar turbine power by Katmai Express. • N17689 Katmai Adventure Trips Inc., Everett, WA. Based King Salmon, AK. Regd 18-May-2005. Note: Seen with Katmai Lodge lettering on tail. May-2008. • N17689 RJF Holdings LLC., Santa Ana, CA. Regd 24-Feb-2014. Otter 431 was delivered to the Ghana Air Force on 19th April 1963 with serial G311. It was the last of an order for twelve Otters, all of which were packed into crates and shipped to Ghana where they were re-assembled and entered service. They were based at Takoradi Air Base. During 1970, Lambair of Manitoba negotiated with the Ghana Air Force with a view to purchasing a number of their Otters, including 431, and marks CF-ZFP were reserved but no deal was concluded and G311 remained in service with the Ghana Air Force. The Otters were withdrawn from service in 1973 and put up for sale. Eight of the Ghana Air Force Otters were acquired by brokers Masin Aircraft of Cologne. Otter 431 was registered to Joseph V. Masin of Rodenkirchen, West Germany as N17689. These eight Otters together with a former US Army Otter which Masin Aircraft had acquired, were sold to Air Craftsmen Ltd., of St.John, New Brunswick, a company which specialised in buying, refurbishing and selling on ex-military Otters. On 26th April 1974 Air Craftsmen Ltd., reserved marks for all nine Otters. Marks C-GLCU were reserved for Otter 431. However, not all these Canadian marks were taken up and some of the Otters, including 431, were ferried to Canada using their US registrations. Otter 431 was the last of the ex Ghana Air Force Otters to be delivered. It passed through Geneva, Switzerland on 18th June 1975 as N17689 and arrived at Fairoaks, England on 26th June '75 where ferry tanks were fitted. It then set off to Prestwick, Scotland and across the Atlantic via Iceland and Greenland to the Air Craftsmen Ltd., base at St.John, New Brunswick. Here it was overhauled and civilianised and made ready for the next stage of its career. 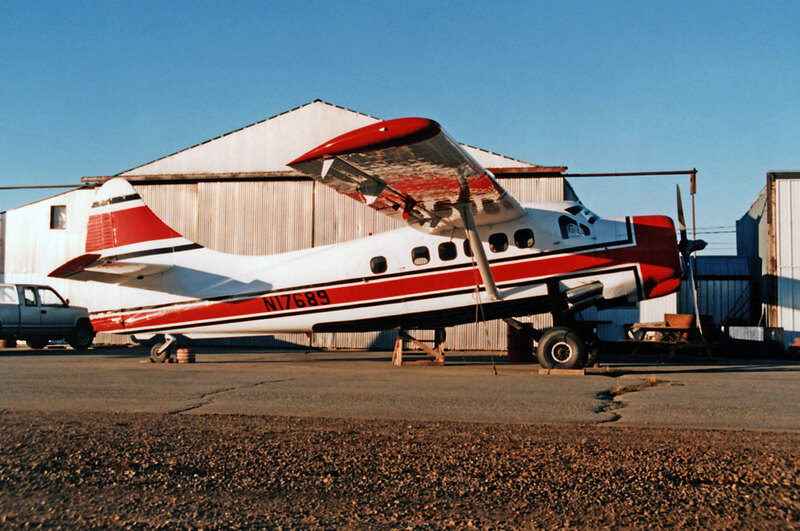 By September 1975, the Otter was ready and Air Craftsmen Ltd., agreed to sell this Otter, as well as Otter 418, another of the former Ghana Air Force aircraft, to Mr Peter Press of San Diego, California, who was involved with a Mexican airline known as Aerosierra de Durango. The two Otters were registered to Aerosierra de Durango in October 1975, 431 becoming XA-FEU and 418 becoming XA-FEV. They then set off from St.John, New Brunswick across the North American continent to Brown Field, San Diego and then further south to their new base at Durango in Mexico. Their operation in Mexico, transporting personnel to lumber camps high in the Sierra Madre mountains, has already been described in relation to Otter number 418. 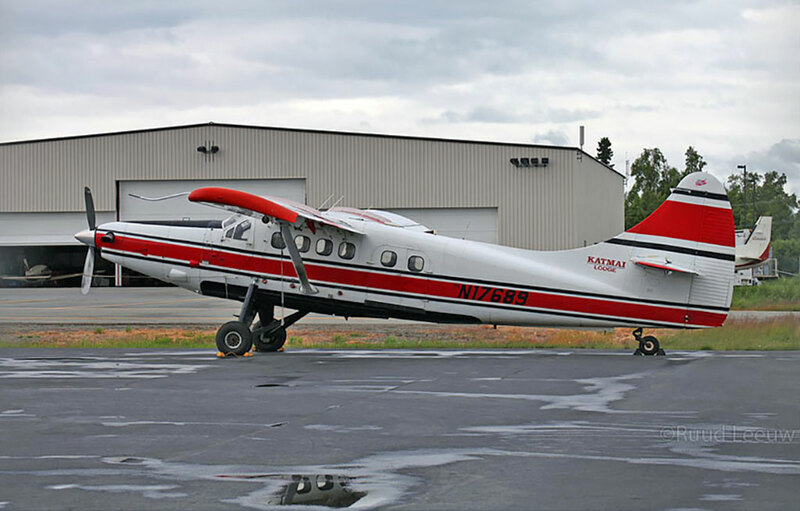 Otter 418 (XA-FEV) was the first to leave Mexico, in August 1976, and was sold to La Ronge Aviation Services in Saskatchewan, Canada. Otter 431 (XA-FEU) soldiered on until November 1977, when it too returned to San Diego. It was overhauled during the winter and on 6th June 1978, a Certificate of Airworthiness was issued by the FAA to Peter Press for the Otter, which at that stage of its career still only had 2,357 hours on the airframe. 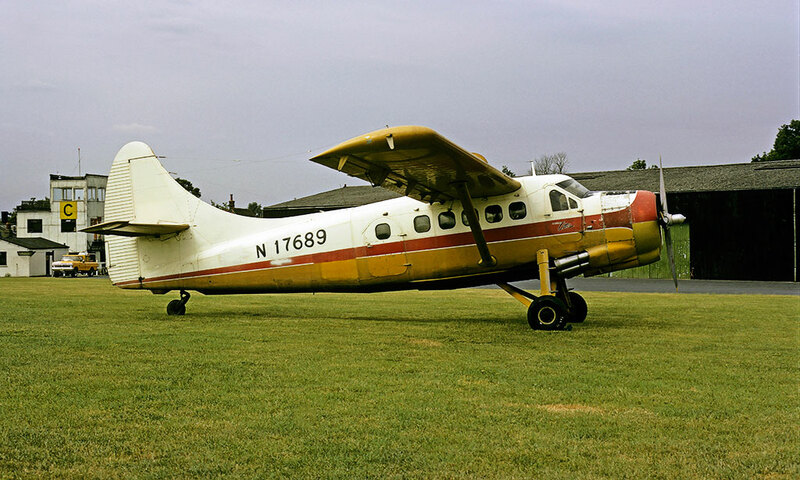 A few days later, on 12th June 1978, the Otter was registered to Peter Press as N17689, taking up again its original US registration which had first been issued to Masin Aircraft, Germany. 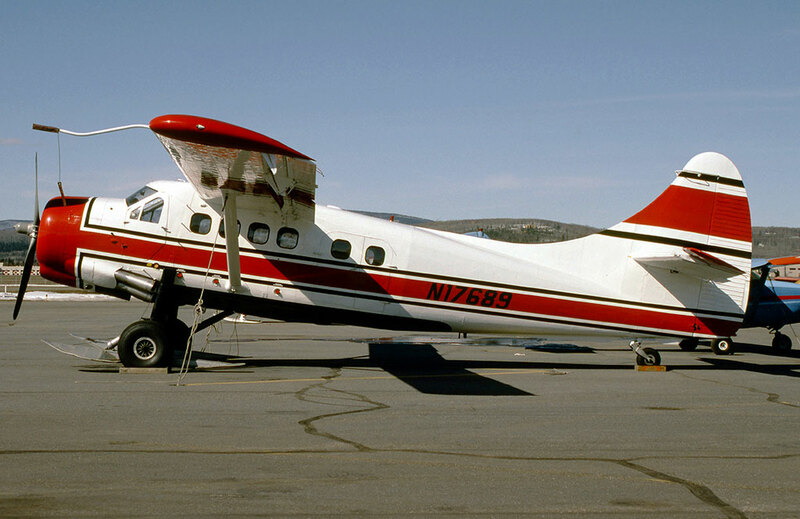 The Otter was sold by Peter Press to B.C.Yukon Air Service Ltd., of Watson Lake, Yukon and was cancelled from the US register on 23rd June 1978 on being registered to its new owners as C-GHYA. 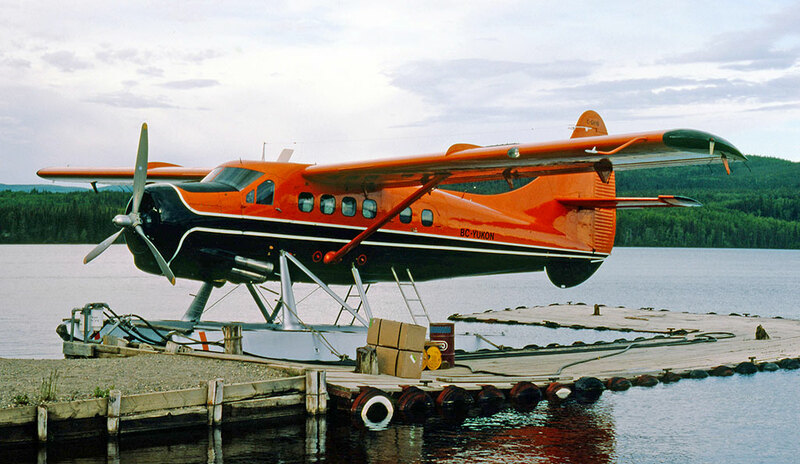 The Otter was one of five operated by B.C.Yukon Air Service Ltd., the others being CF-XUX (72), C-GMCW (108), C-GLCT (430) and CF-DIY (454). 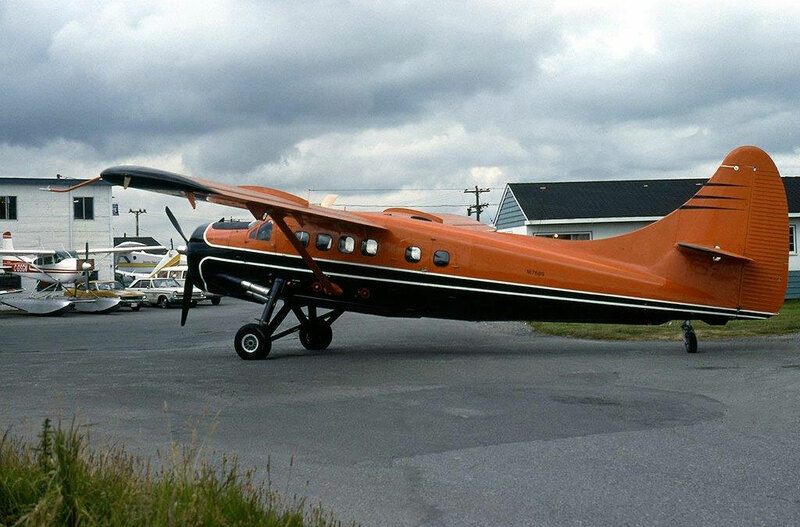 The Otter continued in service until sold to Wright Air Service Inc., of Fairbanks, Alaska by Bill of Sale dated 4th May 1984. It was cancelled from the Canadian register on 9th May 1984 and registered to Wright Air Service Inc., again resuming its original American marks of N17689. By that stage, its total time had increased to 5,490 hours, showing that it had worked hard while in service in Canada. The Otter was collected from Watson Lake and flown to its new base at Fairbanks. Normal area of operation was four hundred miles around Fairbanks. It supported mining exploration camps out in the bush, flew hunters, flew lumber to build cabins out in the bush. It made many trips into the Brooks Mountain Range. N17689 was to serve Wright Air Service Inc., at Fairbanks for twelve years, during which it crashed twice. Its first recorded incident was on 2nd September 1989 at Sheenjek River, Alaska. The pilot reported that as the Otter was on a short final approach to land on a gravel bar, it encountered a downdraft. To avoid contacting the water, the pilot corrected with elevator control and power, but the aircraft gained more altitude than he desired. It touched down on the gravel bar beyond the intended touchdown point. As the pilot was applying heavy braking, the wheels dug into the sandy terrain and the Otter nosed over, causing considerable damage. Repaired and returned to service, N17689 was again damaged at Beaver Village, Alaska on 30th June 1990. The pilot reported a substantial loss of power while in cruise flight. This was caused, it later transpired, by a fractured exhaust rocker arm. The aircraft was unable to maintain altitude and crashed into trees, causing minor injuries to one of the nine occupants. It was returned to Fairbanks and repaired and resumed service..
As to the accident on 30 June 1990, one of the persons on board the aircraft at the time describes what happened. The aircraft was at the time flying north of the Yukon River near the village of Beaver: “The pilot’s name was Colin. He had been taking glider lessons, so was able to use some of that skill to navigate where to put the plane down after the engine failed. He opted for a grove of tall willows. One passenger injured her foot when the undercarriage came through the floor and most on board had bruising, but we were lucky and grateful for Colin’s skill under duress. Colin had time to radio that out engine had failed. A pilot called Roger Dowding of Yukon Air was en route to Arctic Village from Fort Yukon and he heard the call, as did several other pilots including fire fighters who had set up a camp at Beaver. Within ten minutes of the crash a helicopter had arrived from the fire camp to take us to Beaver and a couple of pilots met us there to shuttle us to Fort Yukon. We heard later from Colin that it took two hours with a chainsaw to get to the engine, it was so deep in a tangle of willows”. The Otter had 7,111 hours on the airframe at that stage. It was returned to Fairbanks where a slow rebuild commenced, which would take some years to complete. In September 1994 the fuselage, without wings or tail, was noted behind the company’s hangar at Fairbanks. Work later re-started and was completed by the middle of June 1995. In the course of the re-build the Otter was re-painted into a new scheme of white fuselage, red cheatline and tail band outlined in black, with no titles. N17689 then re-entered service with Wright Air service for summer 1995 and winter 1995 / 1996. On 21 February 1996 the Otter was registered to Robert P. Bursiel, who was the owner of Wright Air Service. It continued to fly for the company but was for sale. It was seen on the ramp at Fairbanks during April 1996 on wheel-skis. On 10 June 1996 it was sold by Mr Bursiel to Katmai Pro Shop Inc., and was delivered to Anchorage. 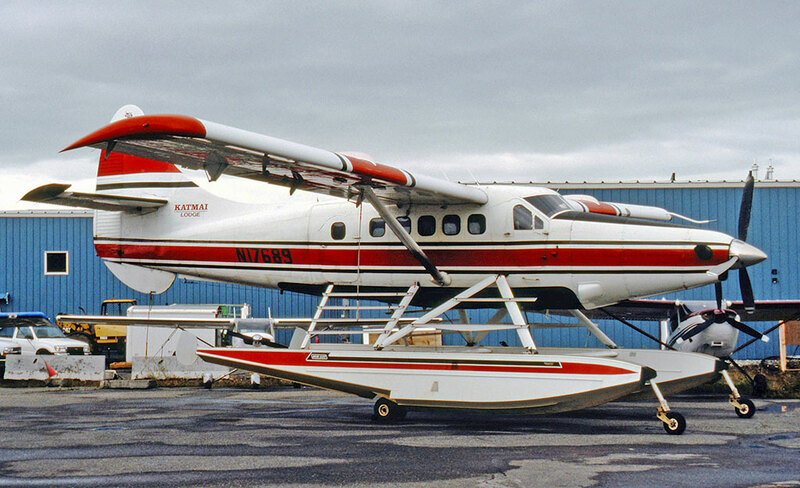 During April 1997 Wipline 8000 amphibious floats were fitted to the Otter at Ketchikan. 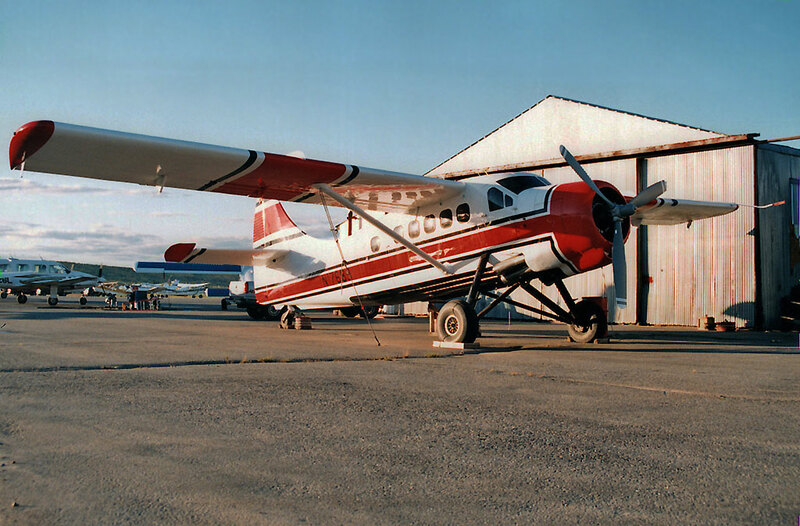 During May/June 1998 an AOG upgrade kit was installed by Ernie’s Aircraft, Anchorage and on 1 July 1998 a Certificate of Airworthiness for N17689 was issued to Katmai Pro Shop Inc. The Otter then had 7,286 hours on the airframe, showing that it had only flown 175 hours since its accident in June 1990. 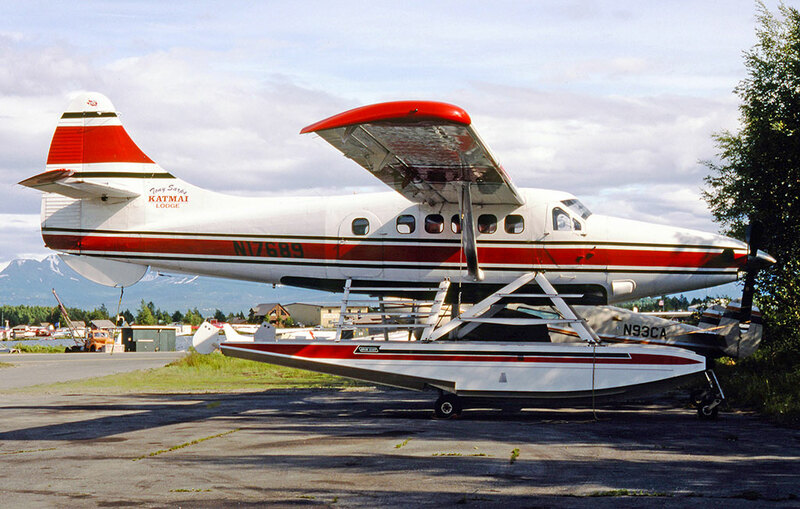 It flew for Katmai Pro Shop for summer 1998 and then went to Vernair in Anchorage who between November 1998 and July 1999 converted the Otter to a Vazar turbine with a PT-6A-34 engine, and it then re-entered service with Katmai Pro Shop Inc., in summer 1999 as a DHC-3T. This company operated the Katmai Lodge, a fishing lodge on the Alagnak River in the Bristol Bay area of Alaska. The Otter served the Lodge alongside DHC-2 Beaver N444EF. As the lodge’s website proclaimed: “Take an exciting fly-out trip on our Turbo Otter from our 5,000 foot runway. The Otter is on amphibious floats. We fly to all the blue ribbon trout streams in the Bristol Bay area”. The Otter was also used to collect guests at Anchorage and fly them to the lodge. It was in the same colour scheme as with Wright Air Service and now carried “Katmai Lodge” titles. With effect from May 2000 the operator of the Otter became Katmai Express Inc., even though the Otter remained registered to Katmai Pro Shop. In December 2002 Dallas Airmotive Inc., who had supplied the turbine engine for the Otter conversion, started court proceedings against Katmai Pro Shop in the court in Dallas, claiming damages, evidently some financial dispute arising from the supply of the engine. In September 2003 Katmai Pro Shop Inc., filed for Chapter 11 bankruptcy in Alaska. On 18 May 2005 the registered owner of the Otter was changed to Katmai Adventure Trips Inc., with an address in Orange County, California. All the while N17689 remained based in Alaska serving the lodge. As its website explained, a new California based owner had acquired the lodge, but business continued as before – “Accessed through its private airstrip, with its own amphibious Turbo Otter, the main lodge rests atop a bluff overlooking the Alagnak River, offering hundreds of miles of fishing”. On 24 February 2014 the registered owner of the Otter was changed to RJF Holdings LLC., Santa Ana, California after another new owner bought the business. He was Robert J. Follman, who is an industrialist from Santa Ana. An announcement on the Lodge’s website explained: “Katmai Lodge is excited to announce its 35th season of exceptional fishing on the Alagnak River. Recently Robert J. Follman of California acquired Katmai Lodge. He has been coming to the Lodge for twenty years and is committed to continuing its great tradition of service”. That remained the position for summer 2018, with the Otter still servicing Katmai Lodge.